I have a soft spot for canned coffee drinks, not because the brands I’ve tried at home in the US have been so great (many are just awful), but because I’ve had some really excellent drinks in other countries, like Korea. This just means that I can’t resist trying one that looks good when I spot it on store shelves. 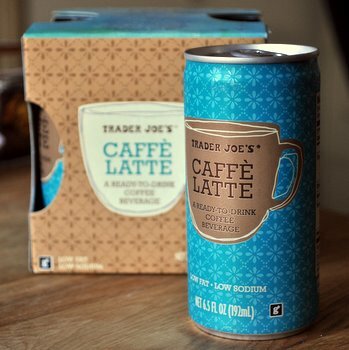 Naturally, I picked up a package of the new Trader Joe’s Caffe Latte Ready-To-Drink Coffee Beverages the last time I was there to give them a taste. The Caffe Lattes come in very small cans (just 6.5-oz) and have a simple ingredient list that includes coffee, reduced fat milk, sugar, vanilla and an emulsifier that helps all those things stay well-blended inside that little can. The overall flavor of the drink is very nice, with a good balance of milk and coffee flavors. The vanilla comes through very well – to the point where I would almost call this a vanilla latte, even though it is actually only lightly sweetened. For my tastes, this is a satisfying little coffee drink that is nice for an afternoon fix when you don’t want to brew a whole new pot of coffee. The little cans are also convenient for taking to the office or bringing along on road trips. Trader Joe’s also makes a mocha version of this drink that I’ll have to try one of these days, too.